So I've been playing D&D with my friends for a few sessions now, and I figure I step things up a bit and give them some real-life puzzlework to do, instead of just 'I roll for perception' and 'I roll for history' etc. So I've made a small handout with a encrypted text on it, and I've done my best to make it look cool and old. Oooo. This is very awesome, and your handwriting is super nice! Did you do it all in one attempt? 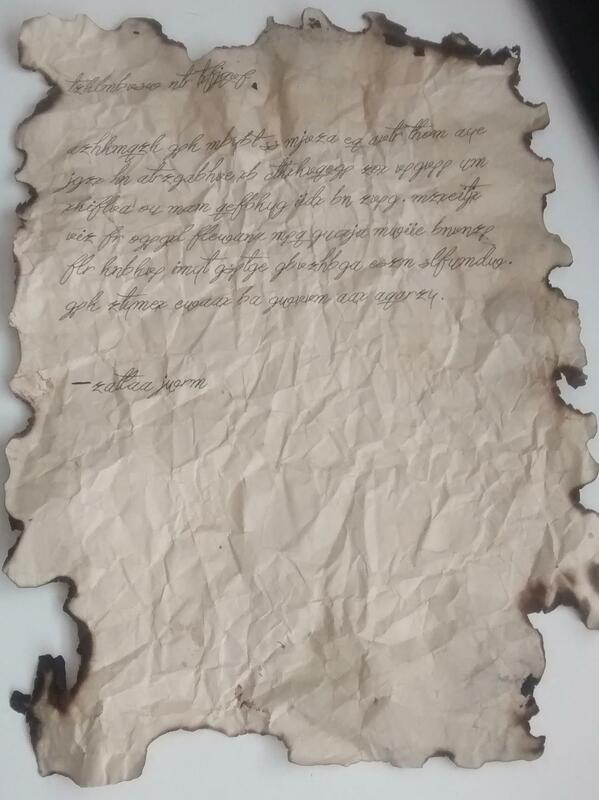 But the staining and burning were all done in one go, just printed out the text, crumbled the paper, soaked it in tea (2 or 3 times over) and then burned the edges. It wasn't really hard, but it took a little while. I really like the result. I've also tried the same method with coffee, which was supposed to be a darker stain, but it's almost exactly the same. Very nice, I remember making things like this for school once; it was great fun. I particularly like the funky font, despite the fact I can't read it all very clearly. Jolly good show, regardless. Well it's encrypted so it's garbled text, and I've got the same text with a more readable font ready incase my players really can't read it.